Rely on more than 12 years of experience in compressed air purification. 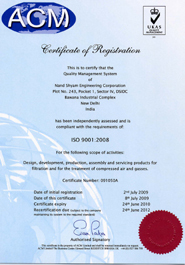 Certification in accordance with ISO 9001:2008. For we promote the continuous improvement of our products just as much as the continuous qualification of our employees and services. Naturally, this only works in close cooperation with customers and users.